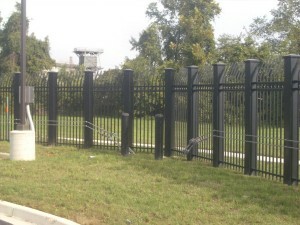 When choosing a fence contractor for a high security application, you need to find one you can trust. One of the best ways to do this is to see what clients have trusted your contractor in the past for their high security fence projects. Here are some of the following clients for whom we’ve done security fence work. Those are just a few of the clients we’ve served, and we think this list speaks for itself. So why did they choose Hercules Fence? We have the experience and the products to get the job done. From crash-rated barriers to anti-terrorism cable, and from barbed-wire fences to anti-climb fencing, our high security line is meant for maximum security. Many of our ornamental security fences not only provide security in and of themselves, but also allow for easy installation and integration of additional security components like fiber optic motion sensors and security cameras. For your high security fencing needs, you can trust Hercules. This entry was posted on Friday, March 28th, 2014 at 9:50 pm. Both comments and pings are currently closed.